The flag of the Shah was a square blue flag with a centered crown (of the same design as in the coat of arms) with a small square canton in the upper left corner including the national flag with the coat of arms. In Flaggenbuch, the size of the imperial Standard is given as 124 x 124 cm, with square canton of 21 cm. Similar to the imperial Standard, but without the emblem in the tricolour canton. Light blue square flag with the crown in the middle. Mara dad farmud va Khod Davar Ast (Justice He bids me do, As He will judge me). Pale blue is the colour of the Imperial Family. A similar flag (although with the shield reversed) is found at http://en.wikipedia.org and WIPO. It is a light blue square flag with a green over white over pink horizontal tricolour in the canton and a golden coat of arms in the centre of the flag. There is however a contradiction. The flag shows obviously the colours, which have been used, according to FOTW, by the Qajars, but the crown in the coat of arms is that one of the Pahlavis. So it might be a very early Pahlavi standard. Note: Source denotes the flag as kings standard, literally translation from "shah" to "König". I guess however the rulers thought themselves being emperors. ALBUM "Die Welt in Bildern Album 7 : Flaggen der Welt, aussereuropäische Staaten", edited between 1928 and 1932 according to the international boundaries in the included map of the world. The flag is depicted in the ALBUM on p.8, image no.259. 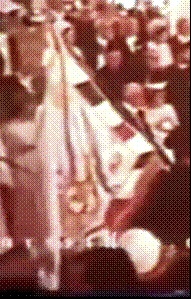 A film of the Shah of Iran's coronation in 1967 is posted at https://www.youtube.com/watch?v=qcvw0jvewR0. Unmistakably, it shows the Imperial Standard with a compony border of angled compartments, in red, white and (presumably) green. It can be seen at these points in the clip: 0:25–0:45; 17:47–17:53; 18:16–18:18; 23:52–24:52. Here's a screen shot from 17:48 (detail).